In 2016, the United Nations Security Council unanimously adopted Resolution 2261 to establish the UN Mission in Colombia (UNMC), a political mission of unarmed international observers deployed across the country. Sixty UN Volunteers were mobilized to support the tasks of verifying compliance with the peace agreement between the Government of Colombia and the Revolutionary Armed Forces of Colombia–People’s Army (FARC-EP), accompanying and monitoring the peace process and promoting a culture of peace. After a 50-year conflict between the Government of Colombia and the Revolutionary Armed Forces of Colombia–People’s Army (FARC-EP), the objective of the UN Mission in Colombia (UNMC) is to support cessation of hostilities and to monitor the abandonment of arms as well as the definitive bilateral ceasefire. Sixty UN Volunteers are serving with the Mission to conduct monitoring and verification exercises and carry out daily inspections of areas around the Transitory Standardization Zones (ZVTN) established under the ceasefire agreement. 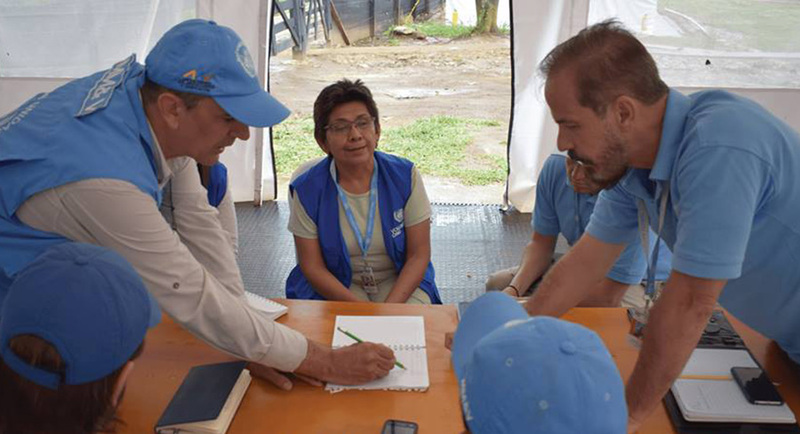 UN Volunteers prove to be valuable assets in meeting mission objectives due in part to their willingness to adapt to difficult living conditions and their motivation to contribute to the peace process in Colombia, as well as their qualifications and previous experience in similar contexts. Beatriz Violeta Lafuente Vásquez (Spain), UN Volunteer Observer serving within the UN Mission’s Monitoring and Verification Mechanism in the Caquetá District confirms that the role of the volunteers is instrumental in facilitating the dialogue between communities, local authorities and FARC-EP. The mediation work of UN Volunteers benefited people in an area where entire communities had been marginalised by local authorities for years. This collaboration between the parties involved, together with the ceasefire and cessation of hostilities, is the most direct way that people experienced the benefits of peace. The UN Volunteers also support the Mission’s Disarmament Assistance (DA) service, as part of the laying down of arms, helping to maintain 24-hour shifts in the DA areas, in conjunction with the military personnel of the Mission. “The added value of UN Volunteers supporting the peace process is that they are highly qualified men and women, really motivated to be part of this historic moment in Colombia, and willing to serve under very challenging conditions. Most of our volunteers come from Latin America and therefore feel a personal connection with the situation in Colombia. They hope that their work will also contribute to the consolidation of peace in the whole region,” says Elizabeth Dambolena, UNV Support Officer with the UN Mission in Colombia. UN Volunteers are also helping to raise awareness about the peace process amongst civil society, promoting the work of UNMC and interacting with communities to understand their perspective of the process. Between 2016 and 2017, more than 90 UN Volunteers have served with UN agencies in Colombia, 60 of which serve with the United Nations Mission in Colombia (UNMC), mainly as Field Officers carrying out observer duties.